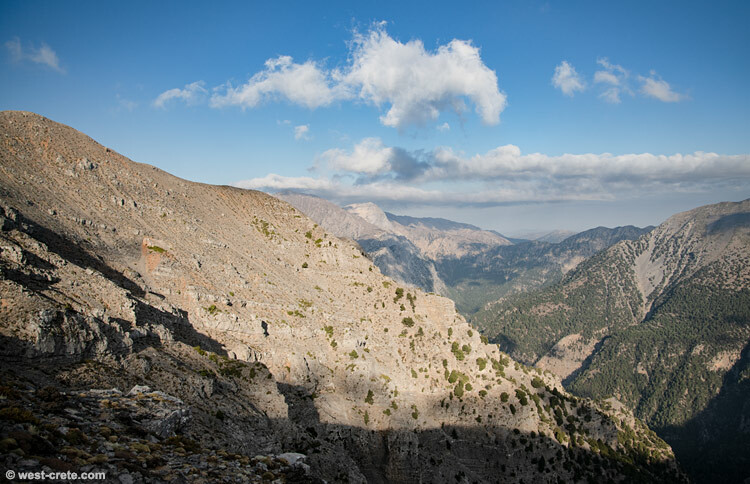 Looking into the gorge of Samaria from the South-East, at an altitude of 1750 m on a ridge that separates the valley of Potamos (and further south the gorge of Eligias) and the gorge of Samaria. The summit to the left of the photo is Avlimanakou. Gingilos is also visible in the middle of the image as the very light coloured mountain. To its left, a little higher and almost touched by the clouds is the summit of Volakias.